What is the best shallow mount subwoofer? Tecnically, it is the JL Audio 13TW5V2 which is been recognized by the industry as the best performing unit ever done. However, for those not interested in spending the big money it costs, there are still some great choices. We will review the top 7 units on the market today. You'll also find a side-by-side comparison chart to help you f﻿﻿i﻿﻿nd the perfect sub for your needs and budget. Although shallow mount subwoofers are not a perfect solution, sometimes they are your only choice. Whether you are on a budget or don’t have room for a larger unit, shallow mount subwoofers can be your gateway to better sound in your car. With that in mind, let’s take a look at some of the best models we have found. Our first stop is the JL Audio 13TW5V2 Shallow Mount Subwoofer. This particular unit is larger than most, which means that you should only buy it if you have enough space. The subwoofer size is a somewhat weird 13.5 inches. However, with size comes performance, and this subwoofer has everything you need to get the best sound possible in your ride. The cone shape is designed to produce better quality results, and the installation process is much easier than you would expect. Overall, this is a great subwoofer for audiophiles who want simplicity and efficiency. It is around 3x/4x as expensive as the P3 Punch, and from the times I've heard both in action, I don't belive it is 3x or 4x better. Made in the USA under the highest quality standards. Our next reviewed subwoofer series does also come from JL Audio. It is the TW3 series which is one step below the exclusive TW5. This subwoofer series comes in two different sizes unlike the TW5, a slightly lower RMS response and a much lower price tag. All the rest remains the same as far as our direct experience on the tests goes since we have felt no noticeable difference on performance from both series. Regarding quality, JL Audi﻿﻿o is pretty much the benchmark-setter when it comes to speakers and subwoofers. As with all JL Audio products, these models have high-quality materials, from their mica-filled polypropylene cones to their aluminum alloy dust caps. Because they are smaller in size, however, the performance level is lower, as you can see when you compare these to the standard JL Audio subwoofer. You can have a look at every component on this video on which Steve Turrisi explains how the subwoofer works and how have they achieved this very shallow size without compromising performance. At around just half the price of the TW5, if we have to choose between just one of the two JL Audio options, we pick the TW3 as we think you get a lot of value for not that much money. Although I've tested quite a lot of Alpine equipment, I've always land on other choices on every price range for one or another reason. This time, however, given the lack of abundance when it comes to good quality shallow mount subs, getting this Swr-t10 on the list was an easy call. On the high-end price range, we find a truly powerful 10 inch sub with a sleek design and a very decent RMS output. Sure thing, it won't bang as loud as the best 10 inch subwoofer on the market but for a shallow mount it is great. What makes this such a great subwoofer is that it has the best materials and components. Alpine doesn’t skimp on anything, so you can be assured that this won’t break down on you or stop working suddenly due to cheap parts. Although the size doesn’t give it quite the same power rating as the first one on our list, you won’t find a better performance at twelve inches. While not quite at the same level as Alpine, Rockford Fosgate is really great about building high-quality audio equipment at a much more affordable price. The saying is "you get what you pay for" right? Well, in this case it is "you get a freaking lot more than what you pay for, dude"
I'm far from hiding that I am a fan of Rockford Fosgate since a couple years back. You see, they did damage their reputation something like 15 or so years ago when they moved manufacturing to china and quality dropped real hard. Thankfully, I got to know RF years later when they already fixed that, so my experience has always been superb. ​If you go for RF's more high-end components you should be ready to drop as many 100$ bills as with JL or Sundown, but for mid-level or even entry level as in this case, man the prices are so sweet. This subs are sold in three different sizes, from 8 inches to 12 inches and although not so powerful as the TW Series from JL or the Alpine, you get a ton of bass. Likewise, powering this subwoofers is quite easy with a decent 4 channel amplifier bridged or a 5 channel amp. Thus far, we’ve looked at subwoofers that were designed for cars or trucks in mind. The Kicker CompRT Series, however, is built extra tough so that you can place them on a motorcycle or ATV if you were so inclined. As a series, you can get two different sizes: either the ten-inch or twelve-inch models. If you do decide to upgrade to twelve inches, though, then you do get better performance, with an RMS rating of 500 watts and peak of 1000 watts. Overall, what is fantastic about these subwoofers is that they are so versatile. The power requirements are low enough that you can install them into almost any system, but the output is on par with a larger, higher-end model. When talking about shallow mount subwoofers, most of them don’t come with any installation covering. For the most part, the subwoofer is by itself and requires that you install it either exposed to the elements or put it where your old one was. In this case, the R2S-1X10 Subwoofer comes with a truck mount, which means that it has paneling surrounding it and comes with thick carpet to protect everything. Thus, if you want a subwoofer that won’t be totally exposed (and you have space), this may be a great option. Another great thing about this particular model is that it produces excellent sound with minimal power requirements. That means that you should be able to install it into most compact sound systems and still get the deep bass that you deserve. Our final stop is the Pioneer TSSWX2502 Subwoofer. This is yet another 10-inch model, but it can pack a punch regarding the level of performance that you get from such a compact unit. Pioneer is another high-quality audio brand, which means that you should feel confident when you install this subwoofer into your car. Much like the R2S model above, this subwoofer comes with a truck mount attached. Thankfully, however, it is much easier to install in small spaces, and the mounting system is much more versatile, so you aren’t limited to a pickup truck cab. 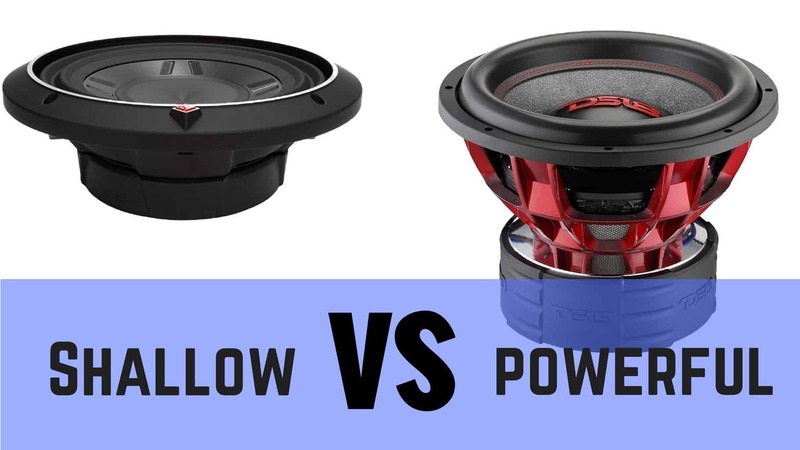 So what exactly is the difference between regular and shallow mount subwoofers? From the picture above I think you can clearly spot the most notable one: Size. When talking about regular subwoofers, the benefit of installing that kind of unit into your vehicle is that you get a full range of sound. Additionally, the sound quality and clarity will be better because it has more powerful components. Better Xmax, bigger coils, usually higher RMS rates... that all means you get louder, clearer sound. If you are a true audiophile, you will most likely want a standard subwoofer in your car. As for shallow mount models, the biggest advantage of them is that they are much easier to put into your vehicle. If you drive a truck, a sports car, or a compact vehicle, then you may be limited in options with regards to how much stuff you can cram into it. Additionally, if you don’t want to have the added hassle and cost of mounting a standard subwoofer, you can use a shallow mount instead. Standard subwoofers may provide you with the best quality, but the tradeoff is that they are more expensive and harder to install. Usually, to get a new subwoofer system into your car, you will have to take it to a certified installer who will take care of everything for you. You could try to do it yourself, but it is a rather complicated process. Shallow mounts, on the other hand, make things much easier. But, their biggest disadvantage is that they won’t provide the same level of clarity or quality. You will notice a big difference if you install them, but you may not get as much as you would with a standard model. For each unit that we will look at, we will provide all of the specs up front. In case you are not familiar, here is what each item means. RMS (Root Mean Square) signifies the standard amount of power that is used for the unit. Sensitivity refers to how loud the unit can get with one watt of power. Impedance means the electric resistance the voice coils offer. It should ALWAYS be paired to the impedance on which our amplifier is meant to work. When it comes to installing your new shallow mounts, you may be scratching your head as to where the best possible placement could be. To that end, we highly recommend two spots that have the best results. Trunk: Depending on the size you go for and how big your trunk is, you may prefer to get the sub and enclosure on the trunk. The biggest advantage of this subwoofers is that they don't require a very big enclosure to work properly. Underseat: Smaller sizes (8 and 10 inches) with really small enclosures may work under the seat of some vehicles, like vans or trucks. This really depends on the space available and if your really are thinking about getting the subwoofer under the seat I'd recommend you go for some of this ones instead. Rear Speaker Deck: It's a simple solution, but I still prefer to mount the sub on an enclosure. It performs better. 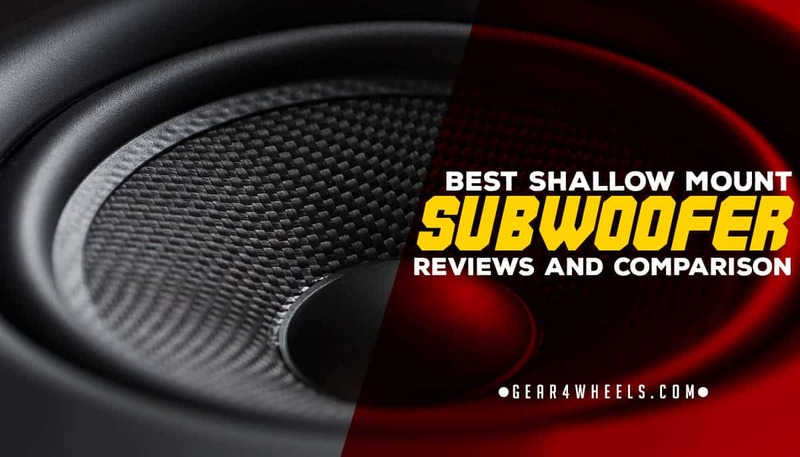 Overall, when trying to find the best shallow mount subwoofer for your car or truck, it will ultimately come down to space limitations and performance level. If you have all the space in the world, then we would highly suggest buying the 1﻿3﻿-inch JL Audio model. If you only have a little bit of room, however, then the Kicker Series is your best bet. If money is no object, then you have to go with Alpine, because they are the greatest. You didn't see here the subwoofer you were thinking to buy? Leave a comment below and we will give you our opinion about the subwoofer. List of the best shallow mount subwoofers available in the market with ratings and a comparison between models. What are your thoughts on the Infinity 1000s shallow mount subwoofer? It did not make your list of best shallow mount subs. I have owned infinity subs in my last 4 builds. However my last build was about 8 years ago. I am building in a 2004 dodge ram 1500 quad cab. I will be using 1 10 inch sub in .5 cubic feet under one of the back seats. Driven with a mono fosgate 351m amp running 150 rms @ 4ohms or I believe 350 at 2 ohms. I have a separate fosgate 301x running MB Quart see ates in the front and MB Quarts 2 ways in the rear doors. I may replace them with infinity at some point. I’m not a big fan of Infinity personally. They made some decent gear a while back but they have gone downhill since. For shallow mount subs, they best option out there right now is the JL Audio TW5v2. Hands down the BEST shallow mount sub on the market by miles and honestly the 2nd best option would be the JL Audio TW3. The Sundown Audio SD-3 is also a decent option. I would steer clear of just about every other brand except those two when it comes specifically to shallow mounts. I currently have a JL Stealthbox in my 2010 Jeep SRT8. The bass is decent, considering its being powered by a Alpine PDXV-9. I am looking to change the woofer in the box, as the 10w1v3 is decent, but I feel it should hit a little better. I tried fitting a 10w3 JL, but sadly, the box isn’t deep enough. What would you recommend to use? I’ve tried the Alpine shallow type R in my 2012 WRX, and blew it after about 3 weeks of use. I listen to everything from classic rock to 90’s hip hop and dance music. I use the crossover on the amplifier, and my EQ settings are flat. Hi JC,, it sounds like you’re looking for a little more oomph from your sub. The Stealthbox from JL is a great choice, but it will only fit the JL Audio 10w3v3 in dual 2 ohm voice coil configuration. You mentioned that you’re using an Alpine PDXV-9. While that’s a nice amp, it tops out at 250 watts in the bridge configuration for the subwoofer. You have a few options for increasing your output. The first would be to get an amp that delivers closer to 400-500 watts for the sub channel, as the 10w3 can safely take about double the power its currently getting. If you can get access to an amp to test, it might be a good first step to add more power and see how it sounds. You should get a bit of a volume gain, but don’t expect huge results. If you feel like your system has reached it’s limits with that sub, I would suggest having a shop build a custom enclosure for a JL Audio 10w6 (or even a 10w7 if you really want to up the boom). You can use the same area as the stealthbox currently sits, without taking up too much space with a standard cube or rectangle box design. The JL 10w6v3 is an amazing woofer that has plenty of output while maintaining meticulous sound quality. The JL 10w7 is a great sound quality woofer as well and gets even louder than the 10w6. Whatever option you choose, you are going to need another amp since you’re not going to find another sub on par with the 10w3 that will get much louder with the amp you are currently using. I would recommend getting an amp that puts out 500-750 watts for the sub, by that I mean not including the power for the front speakers. You could keep your Alpine for the other speakers and just add a new amp for your sub as that would be the best way to get enough power to your sub. You could get another 5 Channel amp and switch it with the Alpine, but there’s not many 5 channel amps that put out the wattage you are going to need. The JL Audio Slash 600/1 amp is an excellent choice for both the 10w6 and 10w7 woofers. The JL Audio HD750/1 is also a great choice. The Alpine MRV-M1200 is also a good choice if you want to stay with Alpine for the amps. Those would be my recommendations for you. If you have any further questions, please don’t hesitate to ask! Thanks. I’m trying to decide between the 12w1 and the 12tw1 for my sedan. I have enough space to fit both options but save space is always a good idea if the performance is not affected. However, according to what you wrote, even the tw1 been a smaller brother from the w3 with all the quality, the w1 (regular sub) problably will be better in performance, right?